Brilliant, beautiful, 21-year-old Katie Brandt, PhD candidate and woman of faith, detects a deadly conspiracy. Suspecting it’s only the tip of an iceberg. 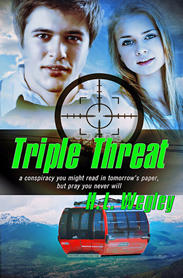 She dives in, pulling fellow grad student, Joshua West, with her into a high-risk investigation of a cyber-terrorist plot. Damaged by the foster-care system, Katie takes huge risks to win acceptance and love. But when she risks the life of Josh, an agnostic who isn’t prepared to die, she fears her mistake might have eternal consequences, a mistake that could break Katie’s heart, a heart rapidly falling for Josh. If Katie and Josh survive the investigation, can they ever span the chasm of divergent worldviews that separates them? How can they awaken a dozing nation to a three-pronged danger that threatens its very existence? In an instant, the honeymoon of Lee’s dreams morphs to a nightmare when Jennifer disappears on their wedding night in Maui. An international trafficking ring that Jennifer crippled weeks earlier seeks revenge by selling her into slavery. But a more sinister organization wants to buy Jennifer for other purposes. With the clock ticking toward Jennifer’s impending sale, Lee, accompanied by foster daughter, Katie, and Jennifer’s grandfather, begins his own search. As the search by Lee, the Maui Police, and the federal government intensifies, beautiful Katie ends up in the crosshairs of the traffickers. Can Lee save both his bride and his future daughter? What if he has to make a choice? If Jennifer is sold, could she kill herself to avoid a life filled with degradation and unspeakable horror? If she did, would God forgive her? With the clock ticking off the last few hours before both the sale of the girls and the arrival of a deadly storm, and with international criminals pursuing them, can Jennifer and Lee save the girls, or will their wedding plans be cancelled …permanently?